How much kitsch is allowed at Christmas? As I walked past the stalls of the Christmas market this weekend, I felt a surge of happiness as I saw the plethora of flashy ornaments and gaudy adornments. It seems Christmas is the season where anything goes and everything is allowed. Tinsel, baubles, lametta, ribbons, fake snow, dancing Santa Claus, snow in cans - and we’re just getting started. I could not help filling my basket with a bit of each. That same evening as I scrolled through my Facebook newsfeed I noticed many already putting up their trees and decorating their homes and once again it put a smile on my face. There they were all again decorations in all their glitzy and glammy glory. While Christmas is an adopted festivity for me, celebrating it with my husband and his family through the years, I have gladly embraced it and take delight in all its elaborateness as much as my 10-year old son does. I love this time of year - the sights of the sparkly fairy lights against the pureness of freshly fallen snow, the sounds of giggles and carols as children run pulling sledges behind them and throwing snowballs at each other, the aromas of peppery incense wrapping its warmth around us as we sit sipping sweet spiced mulled wine huddled by a crackling fire surrounded by glittering decoration. So, how much kitsch is allowed at Christmas? Tell me about your favorite Christmas decorations and ornaments and how you decorate the house at this time of year. In Germany the Christmas trees usually go up around the 23rd but before that we countdown in style, decorating the house with candles, brushwood and some glitter. Each advent we light a candle, inviting friends and family for cake and cookies. As each day passes we open a new door of our advent calendars relishing the contents with satisfaction. Menus are planned, desserts discussed and re-discussed - how can one not love the Christmas spirit? I am collecting your favorite Christmas recipes on my Facebook page and putting them together on a Pinterest board for inspiration so join us and share your favorite or traditional Christmas dish with is. As we countdown to Christmas I will share a few of my favorite Christmas recipes in the upcoming weeks. 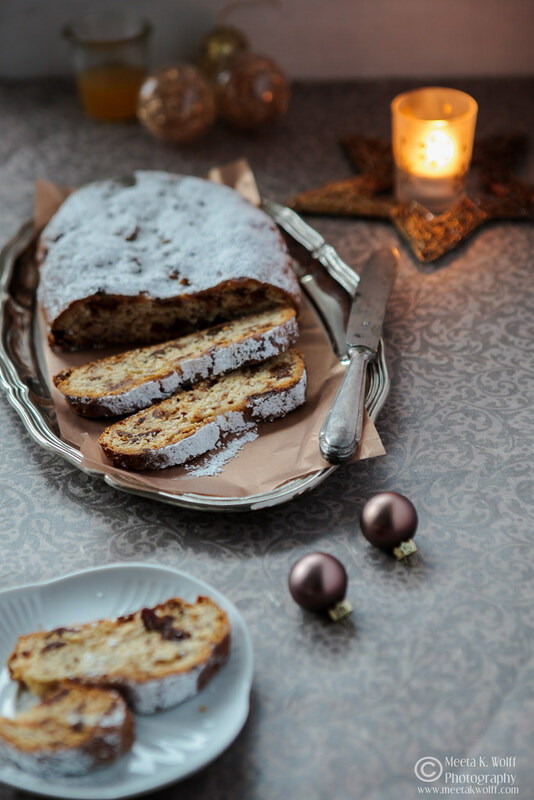 This week I present one of my favorite Christmas cakes ever - a German stollen. However, I have deviated from the traditional stollen and given this my own twist. Sticky dates brought back from Dubai, given to me by my dear and kind friend who grows them on her farm, dried figs, slivered hazelnuts, slathering of orange marmalade and quark all make this stollen moist and rich. The stollen will stay fresh in an airtight container for up to a week. Make your own homemade quark - its easy to make and adds a tangy flavor to the stollen. 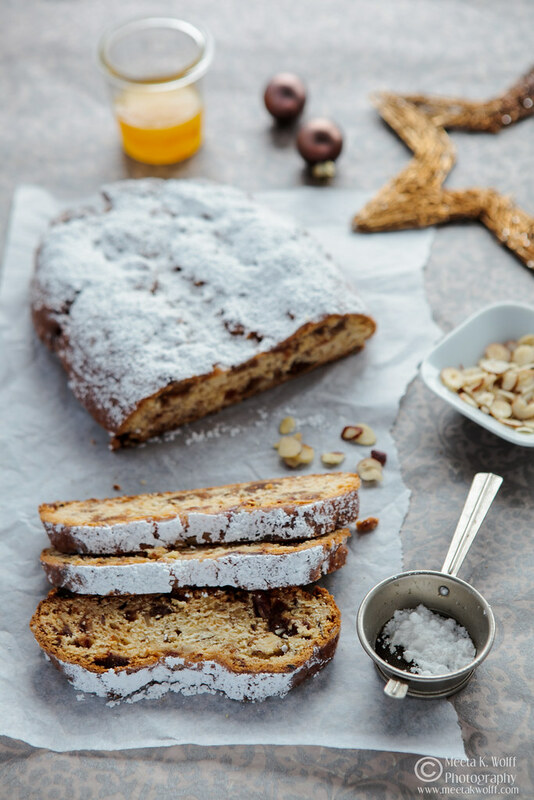 This stollen brings together some heavenly flavors together. The dates are some of the most divine dates ever, small yet sticky, moist and full of flavor. In the stollen they added a sweet aroma and the stickiness was almost like marzipan. The orange marmalade added a refreshing fruity flavor and the quark a wonderful tangy touch. It all kept the cakes moist and unlike the traditional stollen it was lighter and not as dense. This month dearest Simone of Junglefrog Cooking and I have combined our events together - the Monthly Mingle meets the Photo Challenge with the theme Christmas Cakes. I feel like an era is coming to an end as this will be the very last edition of the Monthly Mingle. I started this event in June 2006 and after going strong for so many years it’s time to take a break. I hope that you all will join Simone and me for this one last mingle and bake us some sparkly Christmas cakes! 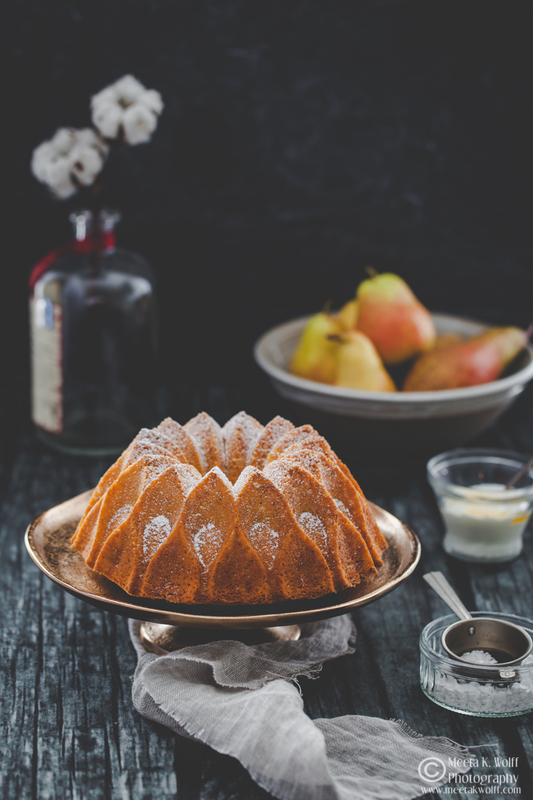 You can still register for a spot at the Supperclub | Food Styling and Photography Workshop in London, together with the talented Sumayya, on 15 & 16 February 2013. We are putting on a full food experience for all foodies attending the workshop. 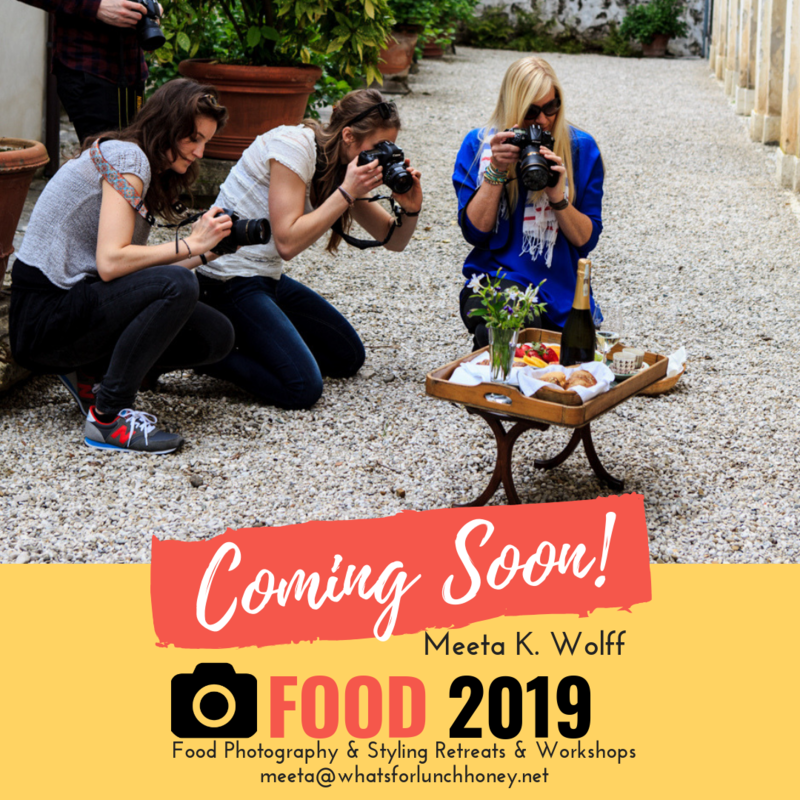 It will be a hands-on food styling/photography workshop lead by me, a session on overcoming the challenges of restaurant and low-light photography by Jeanne as well as a culinary tour through Pakistan and India led by Sumayya where participants will learn different cooking techniques used in the Indian/Pakistani kitchen, create some mouth-watering dishes, and indulge in an array tantalizing South-Asian street food. The main venue is the stunning kitchen at the Central Street Cookery School, which provides huge windows for gorgeous natural light as well as plenty of space for cooking, styling, photographing and eating; and we will also be dining at a gastropub so as to practice the low-light photography skills. This makes great Christmas present! Register for your place on this workshop now. The workshop is limited to a max. of 12 participants and we have a spaces are still available. 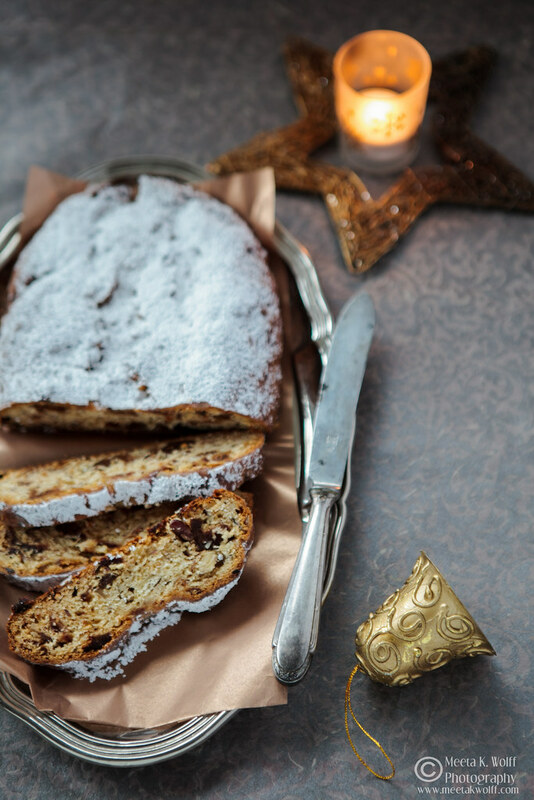 Your stollen looks amazing! What a great combination of ingredients. Simply divine! Thanks Rosa. Yes the mixture of dates and figs with the marmalade was fantastic - will be doing this one again this weekend! 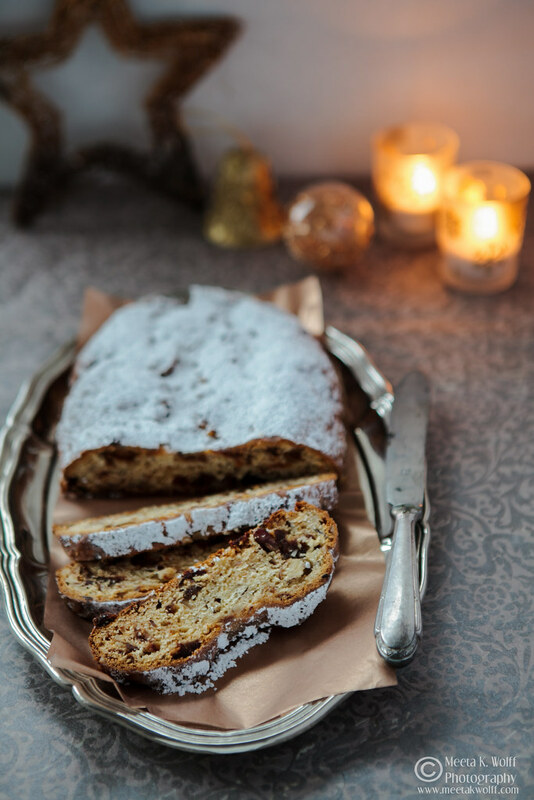 I love stollen and every year we buy one from the christmas market but i am sure these home made ones are far better, wish i could grab a slice. Usually my mother-in-law makes them but this time I thought I would do the stollen baking. It's not the traditional way of stollen baking but it was divine all the same. What a beautiful looking stollen. At home we tend to make more cookies than stollen but I never say no to a piece of Chocolate Stollen which my dad brings home for us. By the way, I added one of my favorite cookie recipes to your facebook page - a great idea to create a pinterest board!! Thanks Antonia! 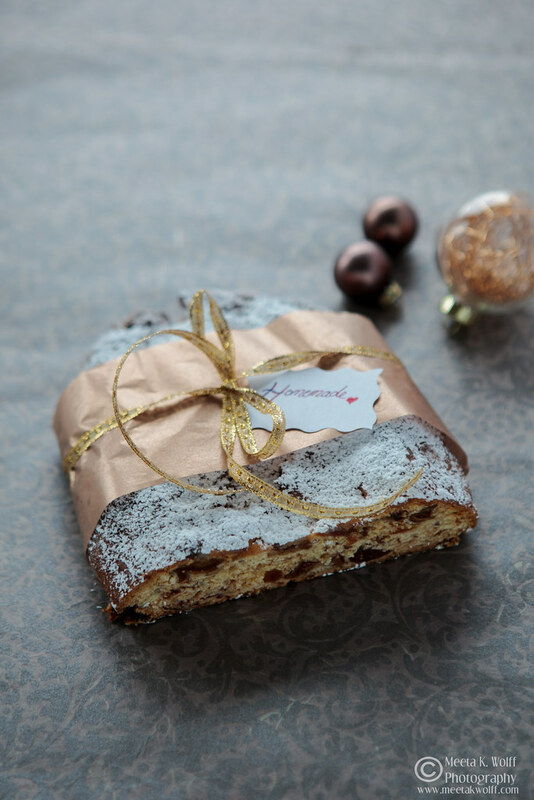 Now chocolate stollen sounds darned good to me. Why didn't I think of that. I do not think I have ever had a chocolate stollen before! Got the cookie recipe and added it to the Pinterest board. Thanks for sharing! I love this time of year too! It makes me a little sentimental and all the beautiful Christmas decorations always make me happy.. 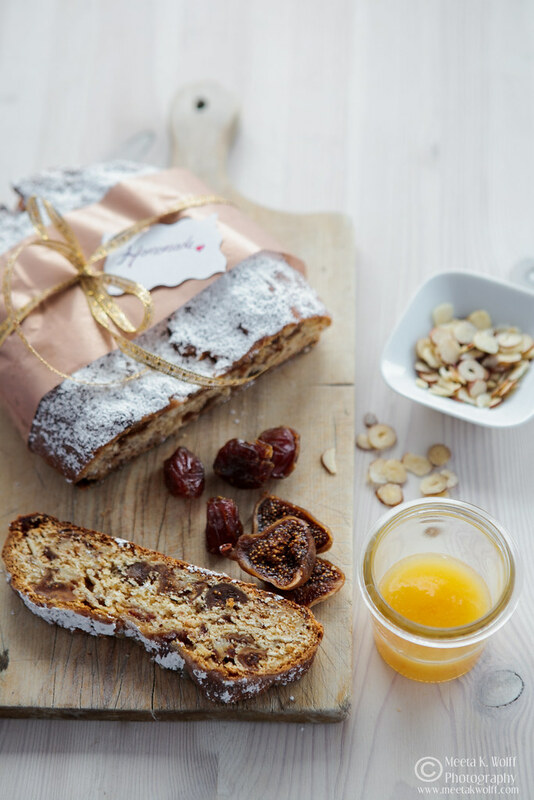 Your Christmas stollen looks perfect. Mine was totally delicious but a tad on the dry side so I need to work on that. Cranberry cake in the oven! Yes stollen can get a bit dry if it is over-baked. The reason I liked this was because the dates and figs + marmalade kept it moist. Did the cranberry cake taste good? I love that recipe! Adorable pictures and a luscious Stollen! I don't like the german Stollen because of the raisins. 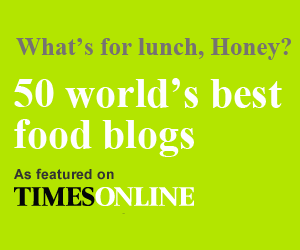 But yours with figs and dates would be great! I like a natural look in decorating and decided to go with a wreath made of olive leaves. I also bought a few nice artdeco candles. But - I am also a girl and a little kitsch makes me feel christmassy - I bought a pink macaron serving poodle lady and a friend gave me candy canes and macarons made of felt for my diy- christmas tree. Oh, and I wear my gingerbread man - earrings - you will see next week, LOL! Stollen would be nice now. Your recipe looks way much easier and pretty much have all the ingredients here except of course quark. 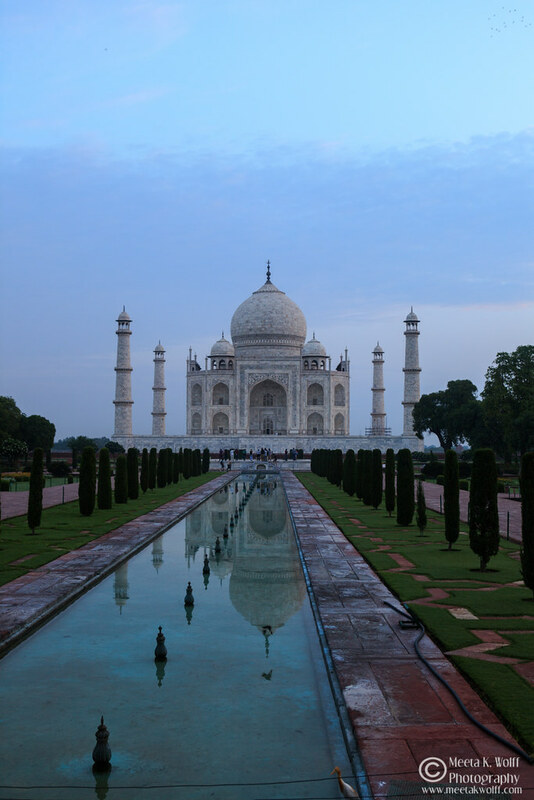 You might know what I could buy in India and use instead of quark because it doesn't exist here. Maybe I ll opt for yogurt. I haven't made any Stollen yet because I am waiting for my mums parcel which contains some goodies, that I need to make this amazing tongue teaser. Gorgeous clicks as always Meeta! Oh and I d love to join your pinterest board. Since we don't have Christmas trees in goa, we decorate our mango tree right next to the house. Something that is always there in each house is the "Krippe" (I don't know what one calls it in english) with the baby jesus and Maria and Josef. I think so in Germany the tradition comes close to the Austrian one. The 4 Advents, the 24 windows calendar, the bell ringing on the 24 th etc. It's very different to what we see in the movies in the US. Helene instead of quark you can hang thick yogurt for a few hours or overnight to let the whey out and get a thicker consistency. That might work like quark a bit. But if you follow the link in the notes to quark you will find a recipe that shows you how to make quark at home. It's really easy. It must be interesting mixing such diverse cultures together under one tree - I like the idea of decorating the mango tree. LOL! I LOVE your wreath! How beautiful! And I love both the elegant, romantic decorations and the loud, gaudy, ostentatious kitchy decorations, too (which is what I miss in the US). And for the food? No Christmas here but how I love baking all the chocolaty, chestnutty, cinnamon sweet things for the holiday season. Beautiful stollen. HA! Well you know you have an open invitation to Weimar (pending for the past 2 years) for Christmas. We can decorate the tree and cook all the sweet treats together. YOu know what I think you would love those candles. I'll take a picture for you when I bring them out LOL! Nazime, we love making our own decorations. You can try drying out lemon, line, orange slices in the oven (very low heat) for a few hours and then wrapping them in twine or wire too. The are awesome as they spread their citrus aroma all over the house. I love stollen! Yours looks fabulous. I was just thinking about how kitsch Christmas is, but I think at this time of year it is nice to just have fun and be a little silly and childish. Yes exactly. This is the one time of year you can release your inner kitsch and noone will look strangely at you HAHAHA! Thank you Ishita - XMAS - tis the season to be kitschy LOL! Que pan tan rico y que fotos tan hermosas. Enhorabuena!! Isabel Muchas gracias! Glad you liked this! Oh I love the glitz and glamour of the holidays kitschy or not it's part of the festive feeling. I'm behind this year and have yet to get my decorations up! I am going to try this recipe. I love Stollen and this sounds amazing. But, my favorite part of this recipe is the link to Quark, and how to make it. I lived in Germany for a long time, and a long time ago, and I so miss all the wonderful foods you just can't get here. I'll be buying Buttermilk today. 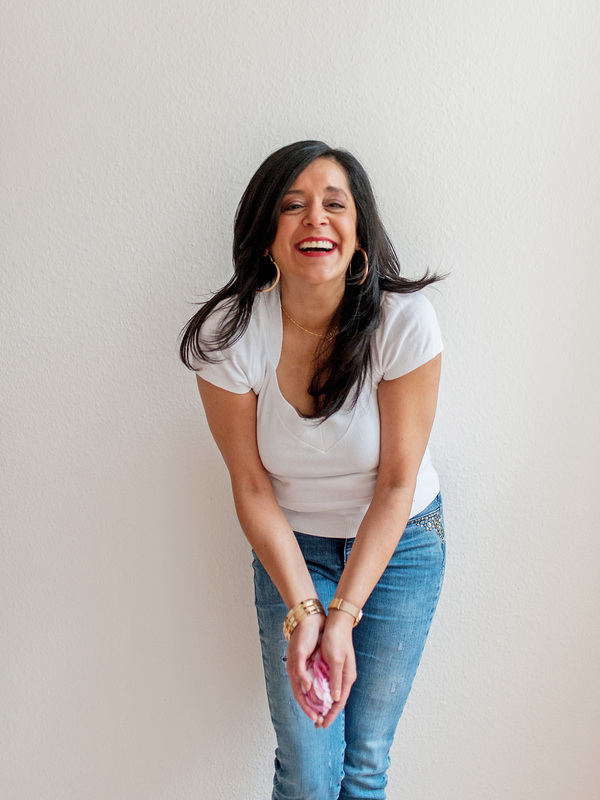 Danke sehr Meeta. And I wish you the best possible holiday. Just found your site and I'm liking your space and so the decorations. Looks absolutely fantastic! Want to try this! Looks great. Would love to have some with a hot cup of coffee on these cold mornings. I love the way you decorate and will take on some of those ideas myself. I've also been trying to think of something on the simpler side to make for Ollie. We are in the states for Christmas and I'd like to give him a little reminder of Germany. Living back it the USA, I already miss some of that kitsch! And no Christmas markets. boohoo. first time here! love it. Super snaps! Love the detail of your images, such depth and texture.